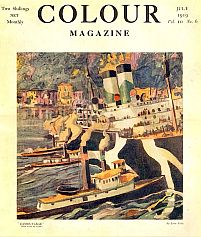 Colour contained an eclectic mixture of short stories, poetry, and articles about art. What makes it particularly interesting is its numerous reproductions (mainly in colour) of work by contemporary British painters, notably by members of the Camden Town Group and the London Group, such as Robert Bevan, Walter Sickert, Harold Gilman and Charles Ginner. It also includes many examples of work by First World War artists. The digitization will include all the advertisements that accompany the magazine.